The Global Volcanism Program has no activity reports for Dotsero. The Global Volcanism Program has no Weekly Reports available for Dotsero. The Global Volcanism Program has no Bulletin Reports available for Dotsero. The Global Volcanism Program has no synonyms or subfeatures listed for Dotsero. A small maar and scoria cone complex at Dotsero, near the junction of the Colorado and Eagle Rivers west of the Gore Range, is the only Holocene volcano in Colorado. Although Interstate highway 70 cuts across a lava flow from Dotsero, this volcanic center is one of the least known in the western United States. The most prominent feature of the Dotsero complex is a 700 m wide and 400 m deep maar that was erupted about 4150 radiocarbon years ago along a ridge consisting of evaporites and reddish oxidized sandstones of Pennsylvanian age. Small scoria cones were constructed along a NNE-SSW line on either side of the maar. Small lahars preceded eruption of a basaltic lava flow that traveled 3 km down two narrow V-shaped valleys and spread out onto the floodplain of the Eagle River, diverting the river to the south side of the valley. Older Pleistocene basaltic lava flows occur nearby at Willow Peak, McCoy, and Triangle Peak. Bass N W, Northrop S A, 1963. Geology of Glenwood Springs quadrangle and vicinty, northwestern Colorado. U S Geol Surv Bull, 1142-J: 1-74. Larson E E, Ozima M, Bradley W C, 1975. Late Cenozoic basic volcanism in northwestern Colorado and its implications concerning tectonism and the origin of the Colorado River system. Geol Soc Amer Mem, 144: 115-178. Leat P T, Thompson R N, Dickin A P, Morrison M A, Hendry G L, 1989. Quaternary volcanism in northwestern Colorado: implications for the roles of asthenosphere and lithosphere in the genesis of continental basalts. J. Volcanol. Geotherm. Res., 37: 291-310. There is no Deformation History data available for Dotsero. There is no Emissions History data available for Dotsero. During the mid-Holocene a maar was formed in central Colorado near the junction of the Colorado and Eagle Rivers west of the Gore Range. The quarry in the foreground is cut into basaltic tephra deposits on the rim of the maar. The 700 m wide maar is 400 m deep and cuts a ridge of evaporites and reddish oxidized sandstones of Pennsylvanian age, which can be seen on the far crater wall. 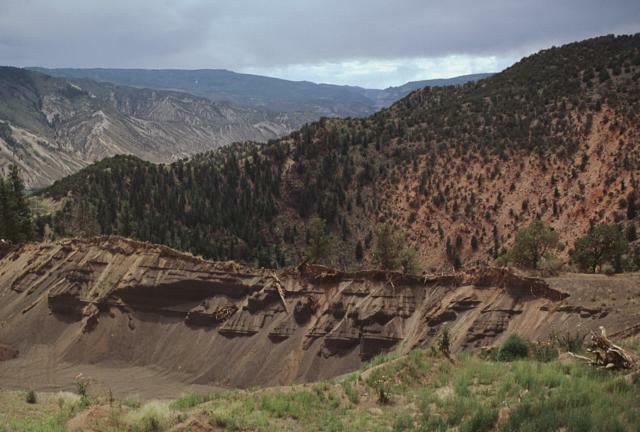 The maar was erupted about 4150 radiocarbon years ago and is the youngest volcanic feature of Colorado. The Eagle River lies to the south in the valley beyond the crater. Large Eruptions of Dotsero Information about large Quaternary eruptions (VEI >= 4) is cataloged in the Large Magnitude Explosive Volcanic Eruptions (LaMEVE) database of the Volcano Global Risk Identification and Analysis Project (VOGRIPA).